Remember the first time you heard music through headphones? Wasn't it amazing? These days we're all used to using headphones with our iPods and portable CD players, but we seldom use with our Macs because there is little ambient noise in the home. Next time you get a chance, dust off those old Hi-Fi headphones and try them again. Better still, get yourself a pair of Sennheiser's open-backed HD485 headphones and use them with iTunes or one of the iLife apps. Incidentally, closed headphones seal you off from the world and make you feel like you've been plunged into a flotation tank. They're designed to cut out most ambient noise, but they make your ears sweat and itch. Open-backed headphones provide great sound quality but allow enough ingress of surrounding noise to warn you should an incoming elephant stampede. They're perfect for using in a video editing suite or when working at your desk in a small or quiet office, or if you work alongside other people that you may need to communicate with. Closed headphones are better suited to a noisy environment. As far as sound quality goes, it's hard to beat Sennheiser headphones. 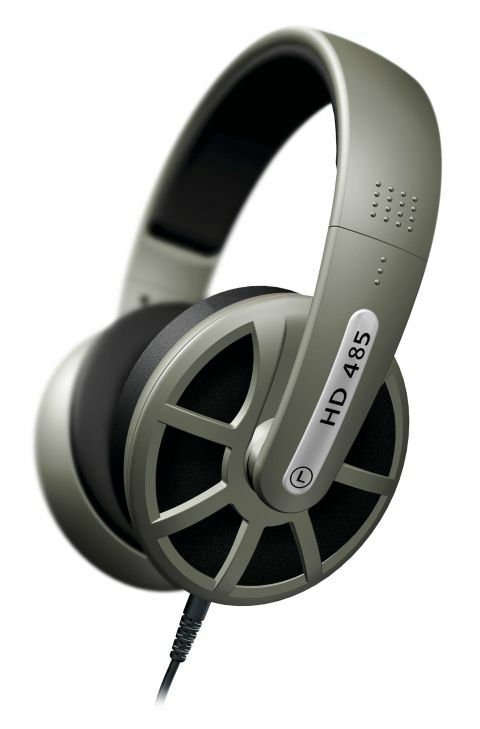 They are the world's leading headphone brand, and these new HD485s build on the performance of their predecessors. Bass is tight and punchy but the overall sound is relaxing and doesn't cause fatigue. A really nice extra is the stand the 485s come with. Screw it onto a shelf and you can hang your headphones up when you're not using them. We also like the fact that the cable features a mini jack at each end, so you can fit a shorter or longer cable as necessary. Oh, and they're very comfortable.